It is not true litigants must subject themselves to the Unites States District 'vaccine' Court. Only US citizens are subject to the United States. You probably think you are a US citizen, but most likely, you are not. There is a very simple way to find out. But first, if you think you are a US citizen, it is because the United States sells you on that perception every chance they get. That is how they make their money as a for profit corporation. That is all they are. 8 USC sec. 1421 is a MANDATORY PROCEDURE that must be followed by everyone desiring US citizenship. No testing, no oath recital, no raising of the right hand, no certificate of citizenship? ... NO CITIZENSHIP! The vast majority of Americans possess no full disclosure of a certification citizenship process capable of creating a nexus with the United States. Believing the lie that the United States has lawful authority over you to dictate the only court you can go to determine damages has no basis in law? That false perception on your part should be abandoned immediately. That is the most far removed from reality lie ever foisted upon Americans due their birthright. They will do everything they can to keep you using their statutory law instead of Gods perfect law! The Common Law court of record is up and running through out America in process of making its foretold return to prominence. The road it travels is through the hearts and minds of free inhabitants everywhere. Give it some thought. American Common Law is the application of the laws of God in every community across the nation. Justice awaits there. I have 2 children who are vaccine injured. My daughter is 24 yrs. old. She was born after a complication free full term pregnancy. She had a reaction to the pertussis shot. Her leg swelled and she screamed all night. She developed multiple seizures everyday and she has very low muscle tone. She is non verbal and non ambulatory. She has has extensive genetic testing done , along with full body skelatal x-rays, all results came back inconclusive. Showing nothing apparently wrong, and yet she is unable to walk, talk or use her limbs. All muscle in her body are severly hypotonic, except the muscles in her face. Her 5 senses all work well. She can eat, chew and swallow well. She can see fine and hears well. 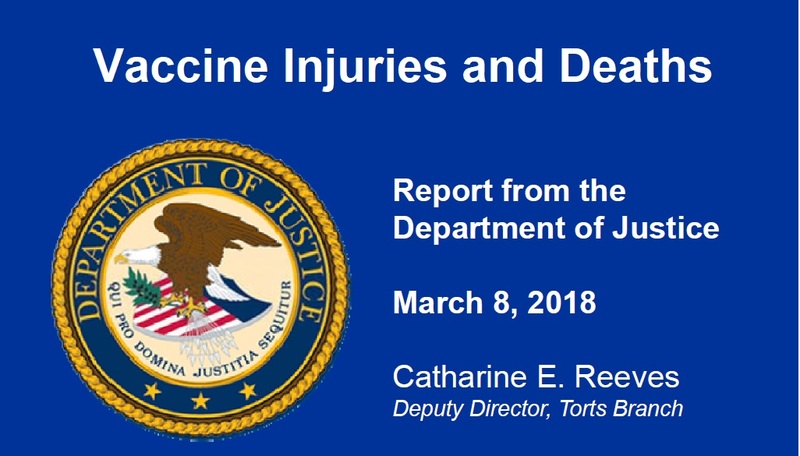 My son, who in 16, was also vaccine injured. He was also born after a completely complication free pregnancy. Both children were born naturally, non c-sections, and without any pain drugs for myself.After his one year visit he seemed to develop what looked like severe sinus allergy signs. His face became continually chapped and red. His nose always ran. He seemed drowsy, like he had been given too much sinus med. It was at his one year mark that I tried to wean him off nursing, and tried to give him cows milk. At my sons 18 month doctor visit (which was a little late and actually was done at 20 months), the PA, who was preforming the exam, made notable comment that he was very advanced in his speech. She said she was testing him at a three year old level. He received his MMR at that appointment. Soon after that appointment he developed a high fever. I tried to bring it down. Nothing was working. I called his doctor many times. He kept telling me different things to try. Childrens tylonol. Childrens advil. Try mixing them up, one, then the other. Try robatussin. Nothing was bringing the fever down Then he stopped talking. He was sick with fever for weeks. The doctor finally seen him and said the reason why he stopped talking was because he had ear infections and could not hear properly. He scheduled to have tubes put in his ears. and assured us that this would fix his speech. It did not. My son was not the same as he was before his vaccines. Neither my son, nor my daughter have speech.